Penguins have become a standard fixture in both zoos and imaginations for centuries. But beyond the classic tuxedo markings of the Emperor penguin and what we see in childrens cartoons, how much do we really know about these fascinating creatures? How aware are we of the perpetual danger in which these animals find themselves after so many years of environmental abuse on the part of humans? David Salomon has traveled the world photographing and studying the various species and subspecies of penguin. From the sleek Galapagos penguin to the bushy-eyebrowed Rockhopper penguin, Salomon combines personal accounts of his trips to remote penguin habitats at the far edges of the world with a comprehensive survey of all available scientific data for the various penguin species. Penguin-Pedia is a wealth of information on penguin behavior, habits, population, and endangerment. 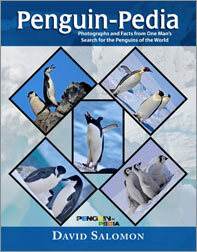 Full of David's own up-close photography, Penguin-Pedia will bring you into the fascinating world of the penguin.